Faculty advocated to protect a large forested area, now called the Conservation and Environmental Research Area (CERA), from the pond to past the research center. There are wonderful trails to explore there. UMBC committed to carbon neutrality, or no greenhouse emissions. So far campus emissions have been cut back 15.5% with goals of more. Student advocates spurred this goal, and now the campus purchases renewable energy and focuses on energy efficiency and transportation options through a campus committee and work group. UMBC designated an additional 11 acres of forest as a conservation area through Maryland Department of Natural Resources (DNR), which protects it from development and requires that trees remain on the land. The UMBC Community Garden was founded by students in 2014 and includes research plots, a regenerative permaculture food forest, and new this year, a bee hive. Green Map: Spots to check out! 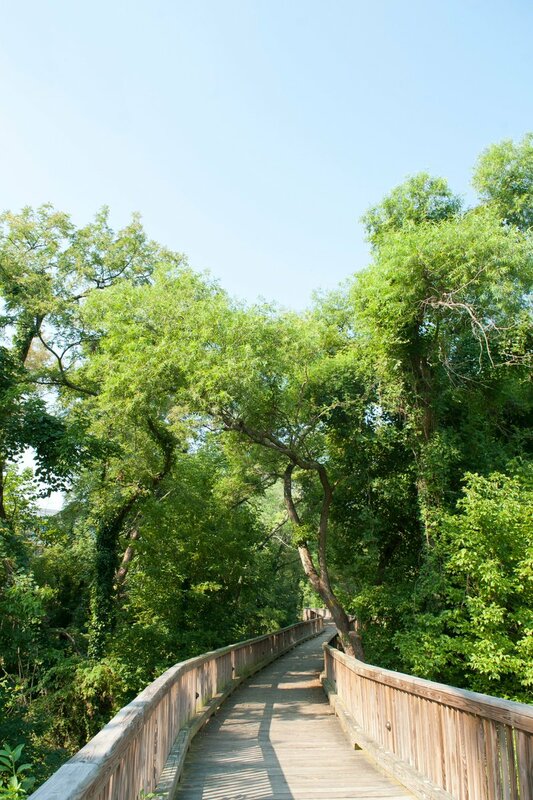 The Herbert Run Greenway was founded by Patricia La Noue, professor emeritus, to connect green spaces on campus along the stream, sculpture park, CERA, and pond. Water Quality: No Mow Zones and the stormwater retention ponds as well as green roofs, vegetated riparian zones, 'pervious pavers' are some features that absorb rainfall, reducing erosion and polluted runoff to enter streams like Herbert Run, rivers like Patapsco, that feed into the Chesapeake Bay. There are 3 green roofs on campus: Administration building, Apartment community center, and the Patapsco hall addition. All new buildings are designed and constructed to the U.S. Green Building Council's LEED certification standards including Apartment community center, Patapsco hall addition, and PHAB. More Transportation Options: The RAC boasts a bike share developed by students in SGA . The campus also offers ZimRide carpooling and zipcar car share as well as Transit shuttles for getting around without having a car on campus in addition to the regular MTA buses and trains. UMBC students wrote a grant proposal through SGA's ProveIt competition, and secured 4 solar charging tables located at the Admin/RAC plaza, at Harbor Hall, and the Commons for outdoors, sustainable work spaces.